You will be spoilt for choice with coconut butter! Have you tried Coconut Butter, yet? This heavenly exotic treat melts right on your tongue and adds that little something extra to sweet and savory dishes. With its many beneficial nutrients the coconut delight is a true boost to your immune system. It’s hardly surprising that Coconut Butter has become a regular in the modern kitchen. Coconut Butter is also popular among vegans, vegetarians and raw food enthusiasts. Always make sure to choose an organic coconut butter without any additives. 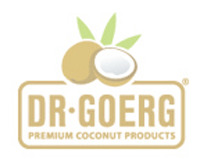 Dr. Goerg Premium Raw Organic Virgin Coconut Butter is obtained from monitored organic cultivation and is produced exclusively from fresh coconut flesh. Within 72 hours from harvest to the finished product – that is our harvest-fresh guarantee! Only the pure coconut butter ends up in our glasses. There’s no room for thickening agents, emulsifiers and water. That’s how you get the real taste of pure coconut and all its beneficial substances. In addition, coconut butter does not contain any trans fatty acids, is naturally gluten and lactose-free – just like our coconut oil. Bottom line: beneficial and delicious all around! Why not try Dr. Goerg Premium Raw Organic Coconut Butter as sandwich spread, in your favorite smoothie, in coconut ice-cream or in any exotic dessert? Savory dishes can also be refined with coconut butter: for example creamy soups, sauces, dips, curries and Asian dishes. By the way, if this has sparked your interest in using coconut butter for your cooking and baking endeavours, have a look at our recipes! 1. Coconut butter is easier to spread at temperatures above 24 °C. Before using it, you can gently melt it in a warm water bath or place it close to a radiator for a short while. Even small amounts of coconut butter provide a maximum of taste! 2. For frying and sautéing we recommend using Dr. Goerg Premium Raw Organic Virgin Coconut Oil Coconut butter is not suited for sautéing, but perfect for anything else!